Diesesmal habe ich eine Kette im "Double Diamond Stitch" geperlt. Verwendet wurden 2,1er und 2,5er Rocailles in gold und 4er Wachsperlen in weinrot. This time I´ve beaded a necklace using the "Double Diamond Stitch". 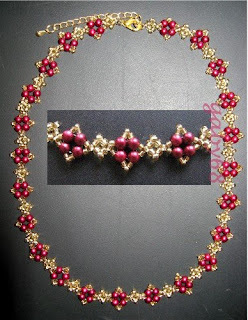 I´ve used 11/0 and 9/0 rocailles in gold and 6/0 round beads in maroon. I LOVE this necklace! Your work is lovely! I AM GOING TO TRY THIS .I HOPPED FROM DR,SONYAS BLOG .FANTASTIC BEADWORK .